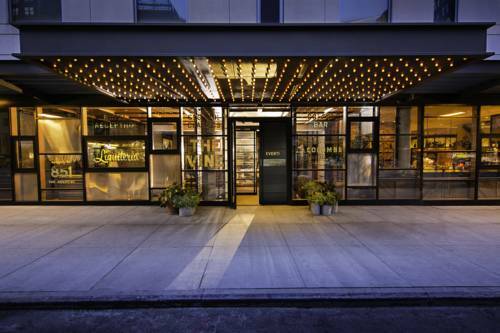 Encompassing an entire block Kimpton Hotel Eventi showcases an artfully revamped ground floor featuring an eclectic-chic living room lobby technology touches everywhere and a collection of cool new bars and restaurants run by famous chefs who know how to cook for the in-crowd. All inside a modern skyrise with floor-to-ceiling windows featuring stunning views and a coveted Chelsea location. If you have stayed with us before it is time to rediscover Kimpton Hotel Eventi and all of NYC for that matter. The Vine is situated right next to the main lobby and features American cuisine with a hint of Italian flare and is open daily for breakfast lunch and dinner.